We do not curently have theatre tickets available for The Osmonds. This could be because we have simply sold out or it could be that this show is no longer running. The information on this page remains purely for historical and informational purposes. 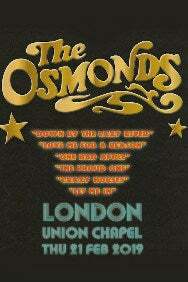 The Osmonds have sold over 100 million albums worldwide and have 59 gold and platinum records to their credit. The Osmonds came to prominence on The Andy Williams Show in the USA during the 1960's where they regularly made appearances. After a brief spell as special guest on The Jerry Lewis Show the band were signed by MGM Records and released their first single “One Bad Apple&” recorded at the Muscle Shoals Studios with producer Rick Hall. The single went straight to #1 and stayed at that peak position for six weeks. The band's albums sold well on both sides of the atlantic too - 'The Osmonds', 'Phase III', 'The Osmonds Live', 'Crazy Horses', 'The Plan'& and 'I'm Still Gonna Need You&' all charted highly. Donny Osmond established a successful solo career charting with 'Go Away Little Girl&' and 'Puppy Love'&. Marie Osmond had a hit too with 'Paper Roses&' before she and Donny launched their own TV show in the USA. The Osmonds continued in the 1980's as The Osmond Brothers with a more Country Music feel to their material. The Osmond Family Theatre was opened in Branson, MO and they are still active now!